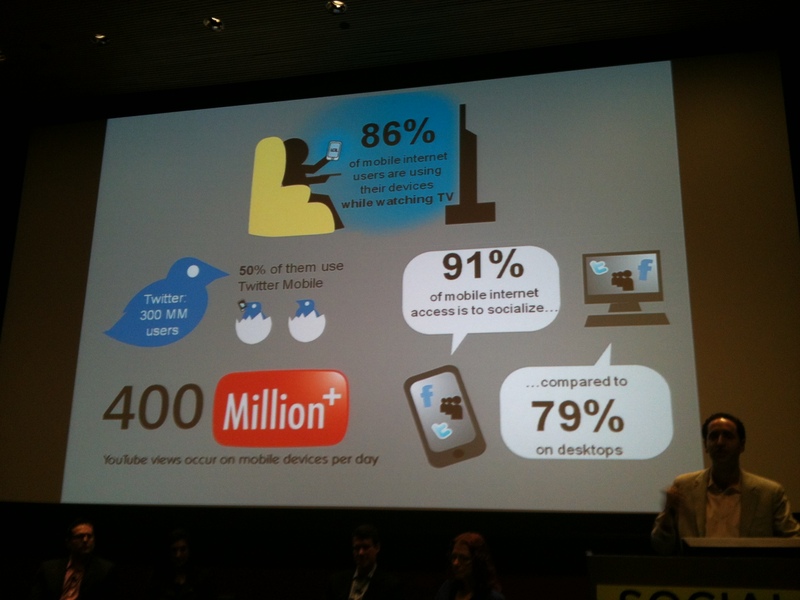 Little to no mention of geolocation here at Social Media Week NYC thus far. Get Glue (not really LBS) was represented on a panel. No sign of Dennis Crowley. Pinterest and Instagram (which does have a bit of a geolocation aspect) are all the talk at the moment. Facebook has recently enabled Near Field Communication (NFC). Is this this first step towards social commerce such that you can transact within the social environment as you can within the Facebook newsfeed? 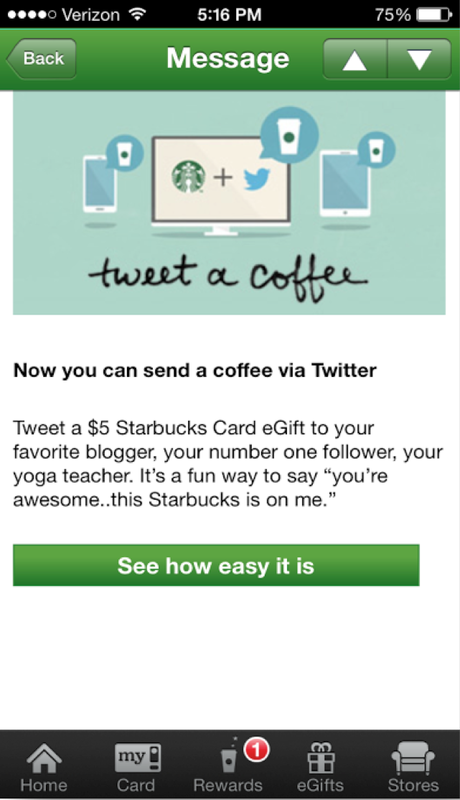 Starting in August 2011, I have posted several entries about Amex’s foursquare program. (See, for example, January 13th above.) For more insight and information, check out this live stream video of a Social Media Week panel. As a consumer, I did not realize at first that the strategy came from the B2B perspective, i.e., as a value add/service for AMEX’s small business customers (AMEX Open). The consumer insight was that AMEX cardholders, especially affluent ones, don’t want to pull out coupons or even show their foursquare checkin to a waiter or clerk. This way, by activating a special offer by simply checking in on foursquare and getting the discount credited directly to the user’s AMEX account, it can all be done discreetly (and simply). 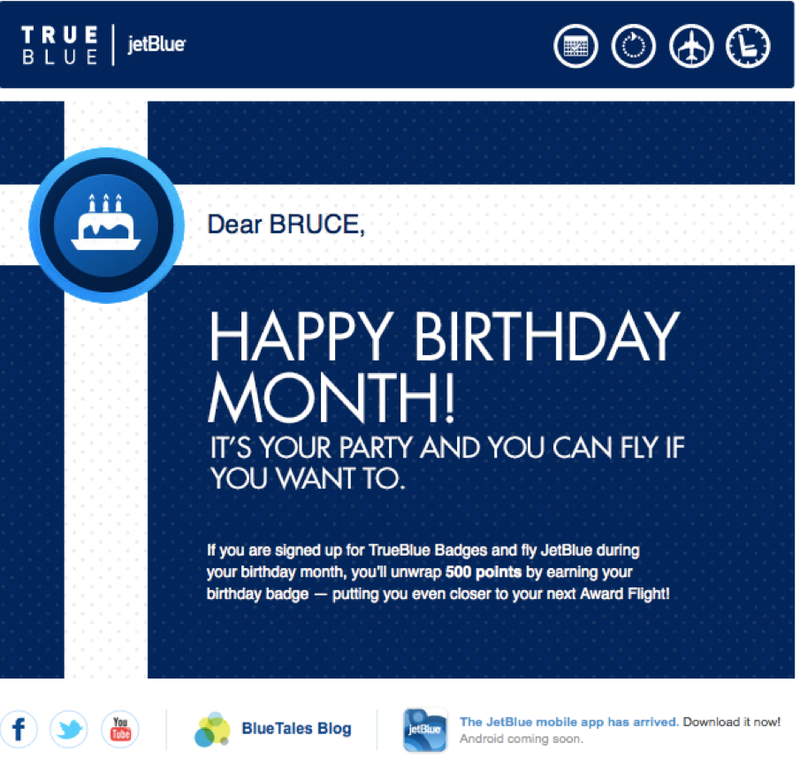 Now that I’ve got it all connected, I really like it, although… I haven’t had any relevant check-in specials pop up recently. Maybe I need to get out more. 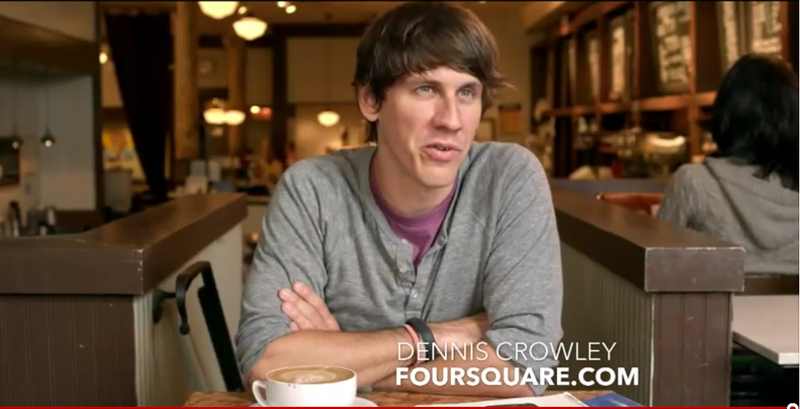 Dennis Crowley (the founder of Foursquare) is starring in an ad for Best Buy and Samsung smart phones. 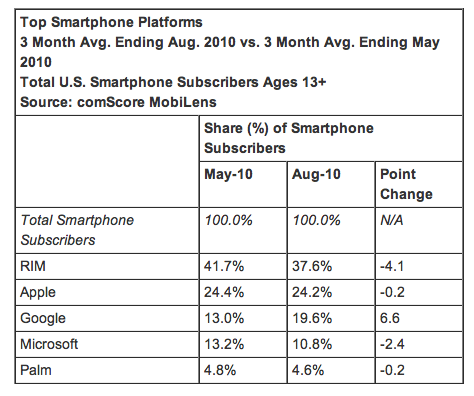 Does that mean Foursquare is in the public consciousness or that smart phones have gone mainstream. Or both? I have to remind myself that there are people who don’t have smart phones. In fact there are people who don’t have access as to the Internet, as evidenced by a public service campaign I saw recently. To the second point, I recently had a moment of insight during a recent trip to Atlanta. As I sat on the MART public transport system with my new iPad, I downloaded an app of the public transport system to familiarize myself with the journey, mapped the journey from the transit stop to my hotel, sent “text” messages to my tennis partner, checked my email, thumbed through my digital photo album and listened to music, I looked up to realize that no one else on the train was using a mobile device. Ok. One. There was one person using an iPhone. For those of you in NYC, I invite you to count the number of smartphones and tablets in use in any one car of a subway, particularly in Manhattan. I would venture to say 75-80% are “plugged in.” Very useful, of course, because it’s completely taboo to make eye contact with anyone else on the train. 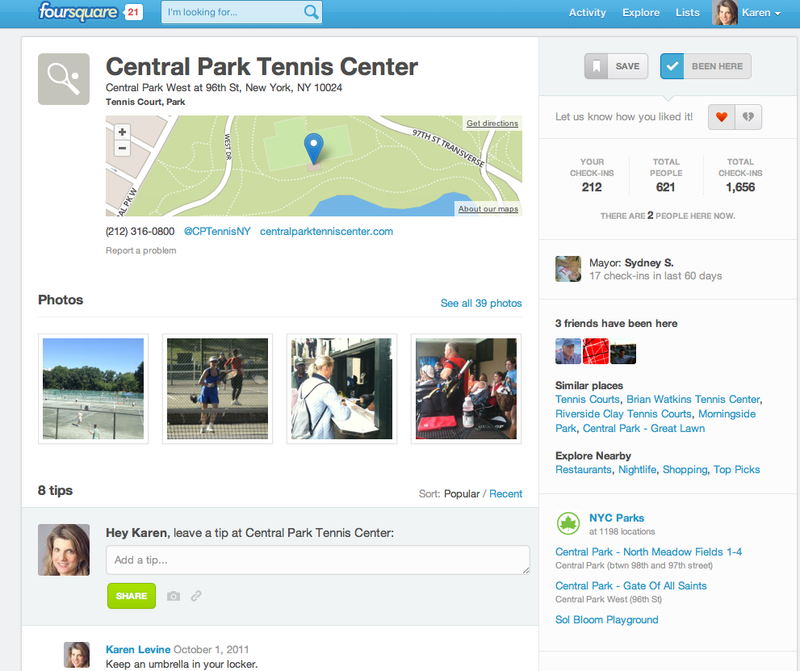 American Express continues to leverage and expand its program with foursquare – and twitter. It’s expecially evident during these three weeks of restaurant week. 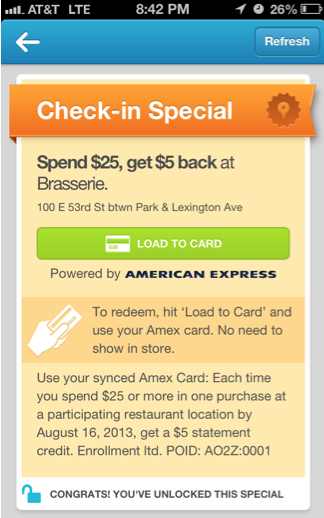 I was pleasantly surprised during a recent visit to Aquavit that AMEX would reimburse me $5 for my $24 meal if I checked in and activated the offer on foursquare. In fact, when I check into four restaurants (on my way…), I will receive an additional bonus – $20, I believe. Today, I checked into China Grill and was devastated to realize that I had left my linked AMEX in my office! I had taken it out of my wallet to buy a cookie for someone in my office. That $4 cookie just became a $9 cookie! Similarly, I recently checked into Andy’s Deli and received a notification that I would get $5 back if I spent $10. This is part of a “Shop Small” program to encourage small, local establishments to accept AMEX. I immediately upgraded my $3 salad to a $10 expenditure that included extra add-ins as well as two big bottles of water. Unfortunately, I realized the next day, when I unlocked a similar special at the nail salon, that I needed to click through one more screen to activate the deal. I had not done so the day before. Hence, my additional $7 in expenditures went unrewarded. I contemplated going back to buy 4 bottles of water for $7 rather than $12 but didn’t want to mess up my pedicure on the walk home. Quickened my gait. 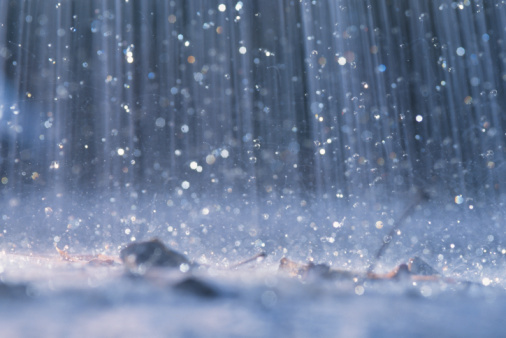 Felt the raindrops! Pulled the cord. Leapt to the pavement. Dashed three blocks in my Pliner wedge sandals. Running between the raindrops, as my mother likes to say. Watched the people scurry to safety from my window. Watched the light show from my desk. Each day, geolocation has a unique impact on my life as I watch the way it influences my city, myself, and increasingly, my world. A few months after joining foursquare in 2010, I decided to keep a journal of my new life with geolocation. You have now entered Part VI this ongoing tale – tracking the personal, sociological and historic milestones associated with the rapidly growing service/game/application. Click on the Geolocation tab for the full story or check my archives for Parts I, II, III, IV and V.
Eureka! I’ve rediscovered specials and – in a way – trending on FourSquare. And, in the process, I happened upon a tie in with Groupon. It’s all so incestuous, these frenemies. In the images below, please note: (a) “Special” next to my local designer pizza joint Freddie and Pepper’s – tied in with Groupon (b) little person image next to the Beacon that shows that 12 people have checked in (c) This is new to me – “Show” icon next to the Beacon. I’ll have to investigate that further. Something GetGlue-ish??? Just arrived home from a phenomenal meal at a restaurant in Chelsea called Westville – an amazing meal thanks to all the people who left me tips on foursquare, from the scores of them who recommended the four market sides for $14 to a non anonymous stranger named Frank, who recommended the chocolate pecan pie. My friend Nancy and I thank you all. It seems that my taste in primetime television is on par with other GetGlue users – and that the app (which is not actually geolocation but was initially positioned as the foursquare for people who stay home..) is gaining serious traction. I checked into “New Girl” along with 7,173 other viewers and joined 14,682 other Glee fans when I checked into that show. I watched both via DVR. Keep you eye on this one. Have you checked out Square’s Card Case app. You should. If only to experience the art of what’s possible. You can pay for things by simply giving your name to the retailer. “shopkick gives you awesome deals and rewards simply for walking into your favorite stores. You can collect your kicks™ rewards at millions of stores in America, and great deals at many of the top national retailers. Collect walk-in rewards: Have you ever gotten rewarded simply for walking into stores – yes, just for visiting? Now you can collect boatloads of kicks™ in the kicks Reward Program and unlock awesome exclusive deals at your favorite stores. Just walk into 1,300 Best Buy stores in all 50 states, and hundreds of Target stores, Macy’s, American Eagle, Sports Authority, Crate&Barrel, West Elm, Wet Seal and the largest Simon malls! Open the shopkick app on your iPhone or Android phone in the entrance area, and wait for a few seconds. Your shopkick app will reward you instantly. shopkick is adding more stores in more cities every month. Get exclusive deals: Discover and unlock awesome deals in the shopkick app at dozens of national stores, many of them are exclusively offered to shopkick users only. Collect scan rewards: Collect additional kicks rewards by scanning barcodes of featured products with your phone at 250,000 stores across the United States. NEAR FIELD COMMUNICATION, or NFC, allows for simplified transactions, data exchange, and wireless connections between two devices in proximity to each other, usually by no more than a few centimeters. It is expected to become a widely used system for making payments by smartphone in the United States. [Gosh, it seems like decades ago that I read about Japan doing this. Oh right, it was. 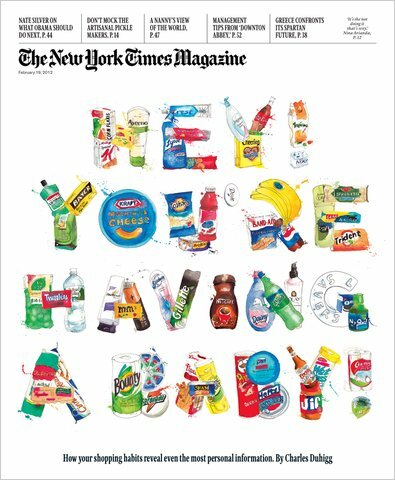 It was commonplace as long ago as early 2006 when I did my first mobile study for BusinessWeek.] Many smartphones currently on the market already contain embedded NFC chips that can send encrypted data a short distance (“near field”) to a reader located, for instance, next to a retail cash register. Shoppers who have their credit card information stored in their NFC smartphones can pay for purchases by waving their smartphones near or tapping them on the reader, rather than using the actual credit card. Co-invented by NXP Semiconductors and Sony in 2002, NFC technology is being added to a growing number of mobile handsets to enable mobile payments, as well as many other applications. File Sharing: Tap one NFC device to another to instantly share a contact, photo, song, application, video, or website link. Electronic business card: Tap one NFC device to another to instantly share electronic business cards or resumes. Electronic money: To pay a friend, you could tap the devices and enter the amount of the payment. Mobile gaming: Tap one NFC device to another to enter a multiplayer game. Friend-to-friend: You could touch NFC devices together to Facebook friend each other or share a resume or to “check-in” at a location. NFC can be used to initiate higher speed wireless connections for expanded content sharing. Bluetooth: Instant Bluetooth Pairing can save searching, waiting, and entering codes. Touch the NFC devices together for instant pairing. WiFi: Instant WiFi Configuration can configure a device to a WiFi network automatically. Tap an NFC device to an NFC enabled router. NFC expands eCommerce opportunities, increases transaction speed and accuracy, while reducing staffing requirements. A Personal identification number (PIN) is usually only required for payments over $100 (in Australia) and £15 (in UK). Mobile payment: An NFC device may make a payment like a credit card by touching a payment terminal at checkout or a vending machine when a PIN is entered. 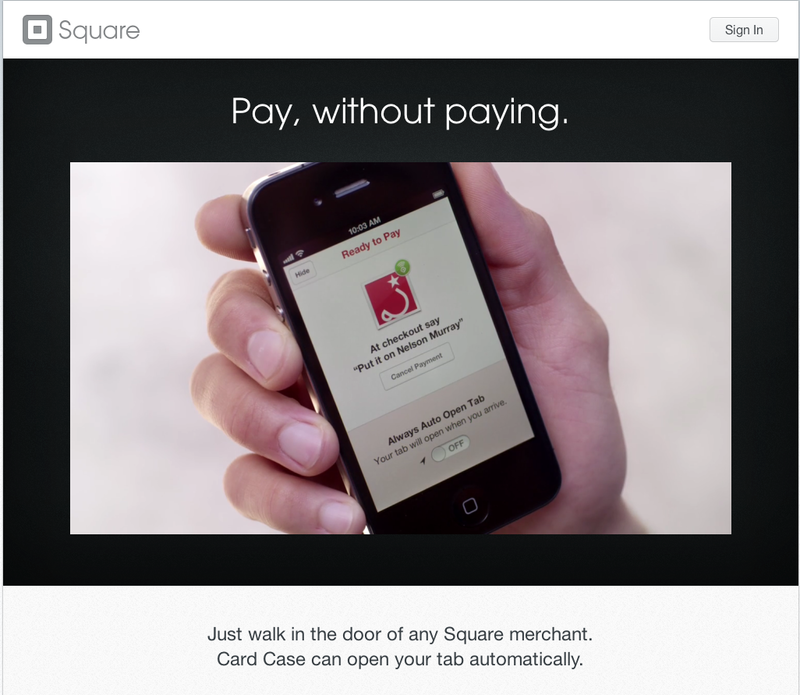 PayPal: PayPal may start a commercial NFC service in the second half of 2011. Google Wallet is an Android app that stores virtual versions of your credit cards for use at checkout when a PIN is used. Ticketing: Tap an NFC device to purchase rail, metro, airline, movie, concert, or event tickets. A PIN is required. Boarding pass: A NFC device may act as a boarding pass, reducing check-in delays and staffing requirementsFr. Point of Sale: Tap an SmartPoster tag to see information, listen to an audio clip, watch a video, or see a movie trailer. Coupons: Tapping an NFC tag on a retail display or SmartPoster may give the user a coupon for the product. Tour guide: Tap a passive NFC tag for information or an audio or video presentation at a museum, monument, or retail display (much like a QR Code). NFC’s short range helps keep encrypted identity documents private. ID card: An NFC enabled device can also act as an encrypted student, employee, or personal ID card or medical ID card. Keycard: An NFC enabled device may serve as car, house, and office keys. Rental Car and hotel keys: NFC rental car or hotel room keys may allow fast VIP check-in and reduce staffing requirements. The future (or past…) is here. I’ve checked into the Central Park Tennis Center 88 times and into my apartment building 726 times. On Monday of this week, Gowalla was acquired by Facebook. That’s huge. What impact will this have on foursquare? If you’d like to read more of my thoughts on geolocation, click on the Geolocation tab or check out Part V of this series. 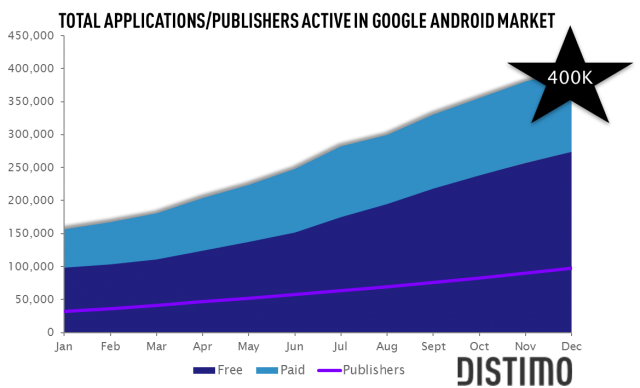 On at least three occasions, I have written posts that incorporated a summary of notable stats about mobile apps and the mobile space in general to set the scene for a topical discussion. But the facts change so fast that I was continuously updating the posts, and the posts had a tendency to grow and grow at the rate of foursquare subscribers. So, I’m breaking 2010 into its own post. It’s not meant to relegate it to the past because it’s not only fascinating but important to see from whence we’ve come. So feel free to compare these stats and info graphics to those in the 2011-2012 post. 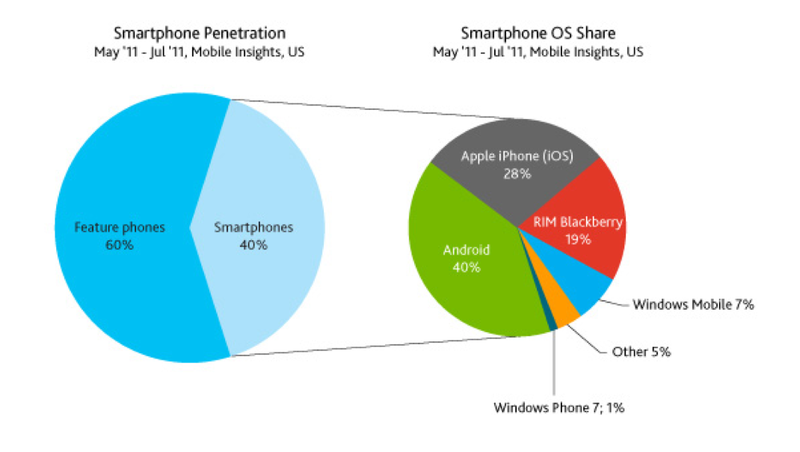 Google’s Android OS is now at 19% and growing. 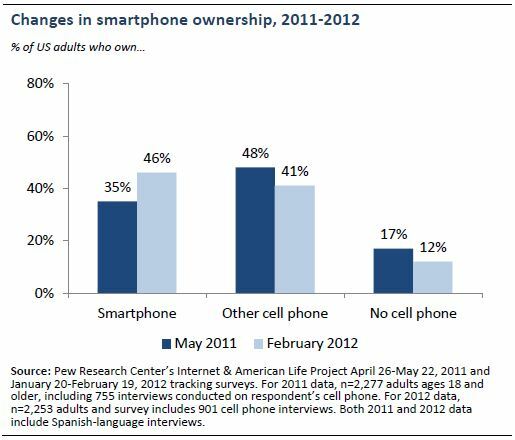 Among consumers who purchased a smartphone in the first half of 2010, 27% opted for Android phones, compared with 23% who bought an iPhone. 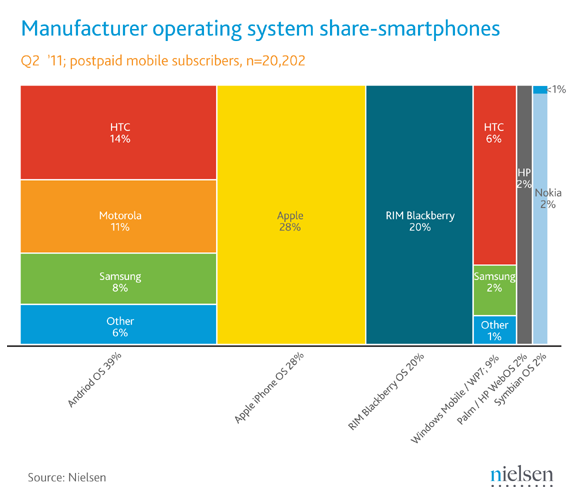 Android’s total market share of 13% still lags well behind both Apple (28%) and Research in Motion, maker of the BlackBerry (35%). Look at Droid go! Look at Droid grow! The discussion of Apps vs. WAPs is heating up with the growth of the Android market and the number of Android champions – Motorola, Sony Ericsson, Google, etc. The advantage of the mobile app is that it can tap into other mobile apps – and, for me, it’s just cleaner and faster to get to. 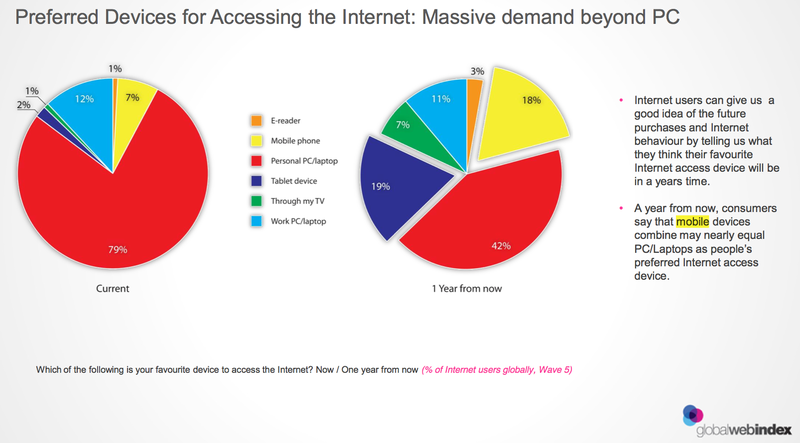 The advantage of the WAP (wireless application protocol) is that it can be richer and closer to the online experience. Apple has revolutionized the mobile space by spurring the development of 200,000+ mobile apps for Apple platforms. Google is calling the browser the “killer app” for mobile that will eradicate the need for developers to create different apps for each platform: Apple, Android, etc. Personally, I don’t see the app marketplace going away any time soon. The use of browser applications may increase as connectivity speed increases (says the poor woman with the AT&T service plan), but I would advise my clients to cover their bases with iPhone, iPad, Droid, and WAP versions – at the least. 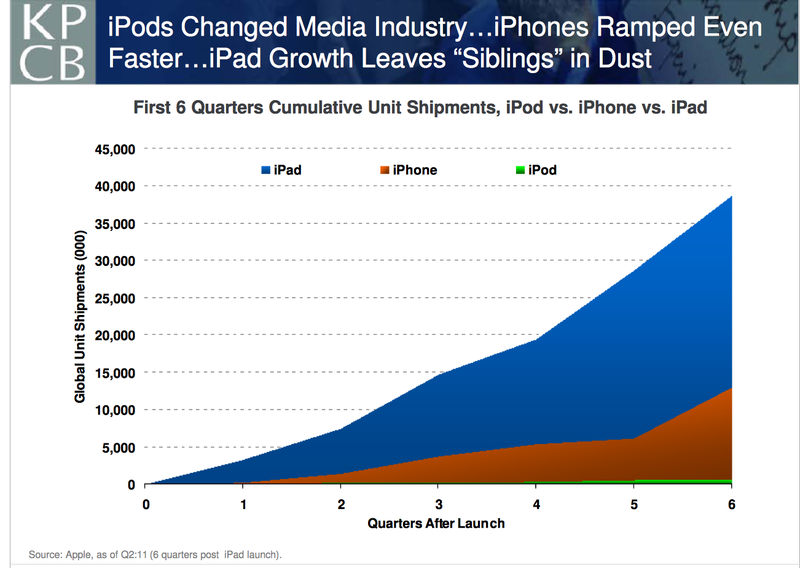 3.5 million Macs and 8.4 million iPhones were sold, with iPhone sales increasing 61% versus year ago. The Company began selling iPads during the quarter, with total sales of 3.3 million. There is a category of apps developed to help people discover… apps. Notable examples include: AppMiner, BargainBin and StoreExtend for finding bargains and seeing what’s new; Apple’s own iPhone Apps Recommendations and Genius offerings; and Appsfire, Appsaurus, Appolicious, Apptizr and Chomp for recommendations and reviews. How Wired Are We – U.S.? Multipurpose smartphones that allow users to access the web and email as well as run thousands of apps and share text and picture messages reached 25% of the U.S. mobile market in June 2010, up from 23% in the prior quarter and 16% just one year ago (data from The Nielsen Company published on its blog Nielsenwire). 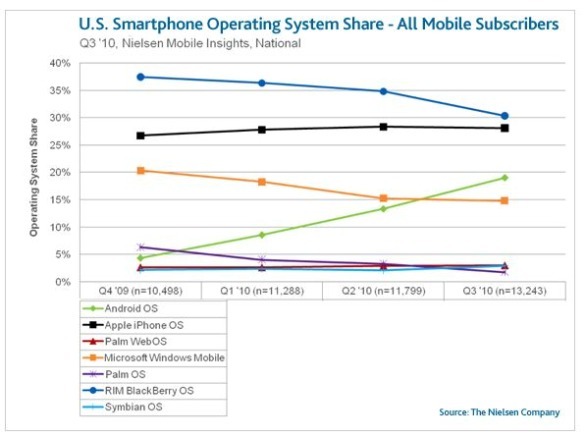 By the end of 2011, Nielsen predicts smartphones to overtake feature phones in the U.S. market. How Wired Are We – Globally? Stanford School of Medicine has given an iPad to every incoming student in the Class of 2014. According to an interview with Manhattan Research’s Monique Levy posted on the blog sitePixels and Pills, nearly 75% of physicians have smart phones – 3 times the general population. 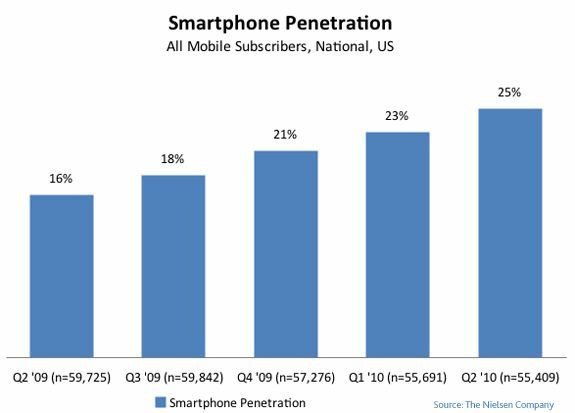 According to Manhattan Research, as reported on darkdaily.com, smartphone penetration among physicians is expected to reach to 82% by 2011, with more than half that number using the devices for such tasks as administrative work, continuing medical education, and patient care. That actually took me quite by surprise. 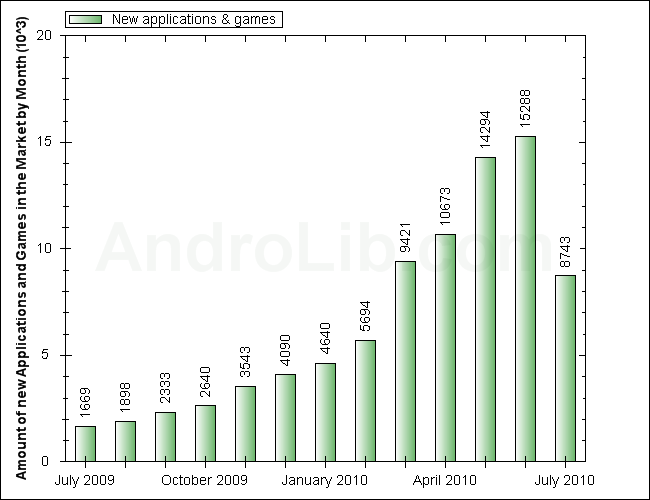 I had heard and believed estimates that there would be 150,000 Android apps by the end of 2010 back, I believe, in late 2009 or at the start of the year. But during Internet Week, I was hearing numbers closer to 40,000 (apps available at that time) and over a recent dinner with Sony Ericsson execs, the number I was hearing was 60,000. But Sebastien Chalmeton tweeted this morning that Android had surpassed the 100K mark – on about the same day that foursquare passed the 2 million mark, by the way, so I am hereby sharing that up to date mobile stat. However… on July 14th, I attended a talk by a Google mobile executive, and the number he was given by Google PR was, in fact, 65,000, which is more consistent with what I had been hearing I will have to circle back with AndroLib to understand the discrepancy. Quite a contrast with Apple’s App Store – single provider, single source of data. Does Droid have that kind of walled garden approval structure?